Thank you for your interest in hosting an event to raise funds for Children's Hospital Los Angeles! As a 501(c)(3) nonprofit organization, we rely on the generosity of community supporters like you to increase awareness of children's health issues and raise vital funds that allow us to continue providing the highest quality health care for children each day. Planning an event takes work, but it is also really fun! For many of you, this may be your first fundraising event; listed below, you will find a few helpful documents to get you started. The steps are simple and the information is designed to help you plan a successful event to benefit Children's Hospital Los Angeles. 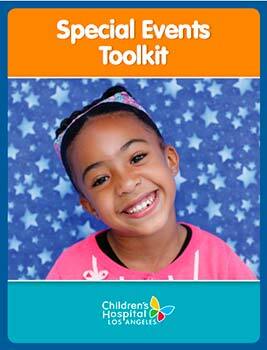 Step 1: Check out our Special Events Toolkit. For purposes of these Terms and Conditions, “you” means the organization, group, or individual sponsoring or holding the community fundraising event. “We”, “our”, or “CHLA” means Children’s Hospital Los Angeles. CHLA may change these Terms and Conditions at any time without notice, and such changes will be effective immediately. Your event should complement CHLA’s mission, vision, and values. We reserve the right, in our sole discretion, to deny applications for events that do not project a positive image of CHLA and to prohibit sponsorship by companies that conflict with CHLA’s mission, vision, and values. Sponsorship by tobacco and firearms companies is also prohibited. You may not state or imply that you are an agent, subsidiary or partner of CHLA, or that you hold any other business relationship with CHLA. You will be authorized to use the official name “Children’s Hospital Los Angeles” in conjunction with your event only upon written approval of your application. The name “Children’s Hospital Los Angeles” may not be altered or abbreviated in any way. We require review and prior written approval of all marketing and promotional materials using our name including, but not limited to, advertising, solicitation or support letters, brochures, flyers, press releases, and website content prior to production or distribution. You will be authorized to use CHLA’s logos only after you sign a separate License Agreement with CHLA. Under this License Agreement, we will provide you with a form of the appropriate CHLA logo to use, which may not be altered in typeface, color, configuration and/or position. Any use of the logo must adhere to established graphic standards. You may only commence marketing, publicity and advertising efforts after we provide our prior written approval of your marketing and promotional materials. CHLA is not responsible for marketing, publicity and advertising efforts related to your event. You must complete and submit your application no less than four weeks prior to your event. Approval is specific to dates listed on your application. If you would like to repeat the event, you must submit a new application. Please allow a minimum of five business days for a response. You must immediately notify us in writing if there are any changes to the event once it has been approved. We reserve the right to observe your event. CHLA will not plan or provide staffing for the event on your behalf, but can help by sharing best practices and templates. If circumstances warrant, we may, at any time and for any reason, direct you to cancel the event, and you further agree to release CHLA, its officers, directors, and employees from any and all liability in connection with any such action. CHLA will not solicit our donors, patients/patient families, and staff on behalf of your event in furtherance of our commitment to our donors, patients/patient families and staff to not sell or provide others with their information. In order to coordinate fundraising activities with CHLA, you must provide us with a list of targeted sponsors of $5,000 or more, before they are approached. Also, please remember that many individuals and businesses already support CHLA and may not wish to make additional donations. When beneficiary status of an event is shared between CHLA and other organizations, we must have the opportunity to approve beneficiary status in writing prior to the event, and all beneficiaries of an event should be listed on invitations, promotional items and press releases. In order to provide your donors with important information concerning their contribution, all promotional materials should clearly state the percentage of proceeds (from gross or net proceeds) and/or the portion of the ticket price that will benefit CHLA. You should limit expenses to 50% of the total raised by the event. We cannot advance any funds or pay anticipated expenses or reimburse expenses related to the event. If event expenses are greater than the money raised, you are responsible for paying those expenses. You may not keep or use any portion of the proceeds as profit or compensation for organizing the event. You may not hire a professional fundraiser, telemarketer, and/or enter into any other fundraising agreement with a third party without our knowledge and prior written approval. Because CHLA is not the event host, your event’s revenues and expenses cannot flow through CHLA’s accounts. Accordingly, unless your application specified a different percentage and was approved, 100% of net proceeds (gross revenues minus expenses) from the event must be donated to CHLA. Similarly, you cannot set up a temporary bank account in CHLA’s name. Proceeds should be sent to CHLA no later than 30 days following the event and should be mailed to the Special Events Department at 4650 Sunset Boulevard, #29, Los Angeles, CA 90027, Attn: Special Events. Because of our responsibility as the recipient of community assets, we reserve the right to audit and inspect all event records if any questions are raised about your event. CHLA may receive funds from other similar promotions. Our acceptance of your application creates no exclusive rights for you. You are responsible for obtaining and filing all applicable government permits, licenses, and/or applications. You also agree to carry out your event so as to not do or allow any of the prohibited acts and practices described in the California Nonprofit Integrity Act (Government Code section 12599.6(f)). Events must comply with all federal, state and local laws governing charitable fundraising and gift reporting. We may only issue gift receipts for checks/money orders made out to “Children’s Hospital Los Angeles.” If your donors send their contributions directly to CHLA, you must inform us of the value of any goods or services the donor received in return for the contribution. CHLA will issue gift thank-you letters for in-kind donations if you provide complete information for all applicable donors. You agree that you will not represent to the public that you enjoy any tax exempt rights or privileges as a result of your role in your event (unless you have separate tax exempt status). You may be required to obtain your own liability insurance to cover the event and all other insurance including premises liability and worker’s compensation. You agree to indemnify and hold harmless CHLA and its officers, directors, employees and agents from any and every claim, demand, suit and payment related to or caused by your event. CHLA will not insure your event. CHLA and its officers, directors, employees and agents are not responsible for the cost, planning or staffing of your event. CHLA will not assume any legal or financial liability associated with your event nor will we indemnify you, nor any party involved in your event, for any damage, expense, or other costs arising from or in any manner related to your event. CHLA is not liable for any personal injuries or damage to property occurring during your event and we cannot assume any type of liability for the event. CHLA will not associate with events held at gaming venues. Step 3: Complete the community fundraising events application. Please allow 48 hours after submitting your application to receive a response from the Children's Hospital Los Angeles event staff. Upon receiving approval, you are then ready to begin planning your event. The Special Events team is here to help you with the next steps and any questions you may have! Check out our helpful Special Events Toolkit, which will give you all the information you need to organize a great event to benefit Children's Hospital Los Angeles.